Detectives from the PSNI's Serious Crime Branch have been granted extra time to question a man suspected of the murder of Londonderry teenager, Jordan McConomy. The extension was approved by a court on Monday. The man was arrested on suspicion of murder on Sunday and taken to Strand Road Police Station. Jordan, 19, died after he was assaulted in William Street in the early hours of Sunday morning. 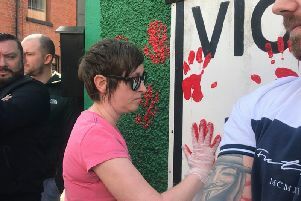 Detectives from the PSNI's Serious Crime Branch have appealed to anyone who may have witnessed the assault to come forward. The police also appealed to any taxi drivers with dash-cams who were working in the area between 1.45am and 2.15am to contact them. Jordan was from the Rossnagalliagh area of the city and his death has sent a shock-wave through the local community. Family and friends used social media to convey their devastation and sadness. "Words can't describe what my friends and family are feeling right now," said one friend. "I only met Jordan twice but I could tell he was a wee gentleman," added a family friend.